Eww-w-w-w-w-ww. Doesn’t sound very appetizing does it? I assure you, this dish does not contain any parts of any porcupines. There were no porcupines harmed in the making of this dish. When I was a kid, my mom and dad made these all the time. It’s a great comfort dish and back then it was a great budget meal too. We loved these porcupine balls. I started making these for my daughter when she was little and it was a favorite of hers. She wanted them all of the time…..I mean, all the time. She started asking for them early on and she would dance through the house singing “we gonna have a poka-pine balls!” Then she would invite all the kids in the cul-de-sac. Of course they didn’t have a clue as to what they were being invited over for. So, in case you don’t know, they are called porcupine balls because when cooked, the rice is sticking out all over the outside so I guess it looks kinda like all those pointy things on a porcupine. Who knows…..but really, I could care less. I just like to eat them. Super simple, inexpensive and definitely a comfort food. 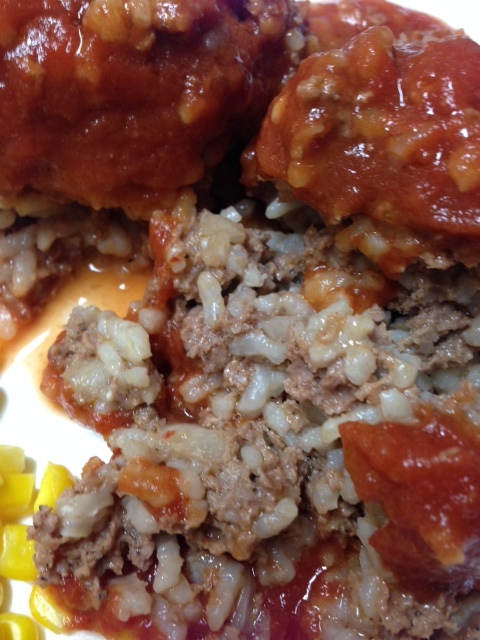 Basically, it’s a meatball…..a meatball with rice in it. Simple. I ALWAYS, ALWAYS have had these served with corn. It just has to be that way for ME. I just can’t have it any other way. Nope, can’t do it. But you can serve it with anything you want. 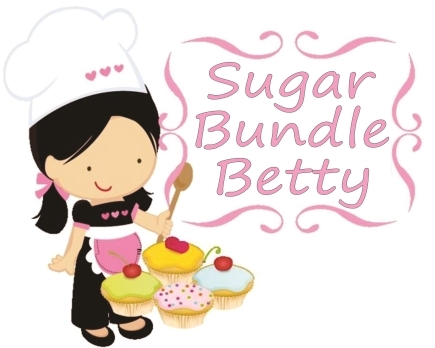 Make these….really……..soon…..this week. 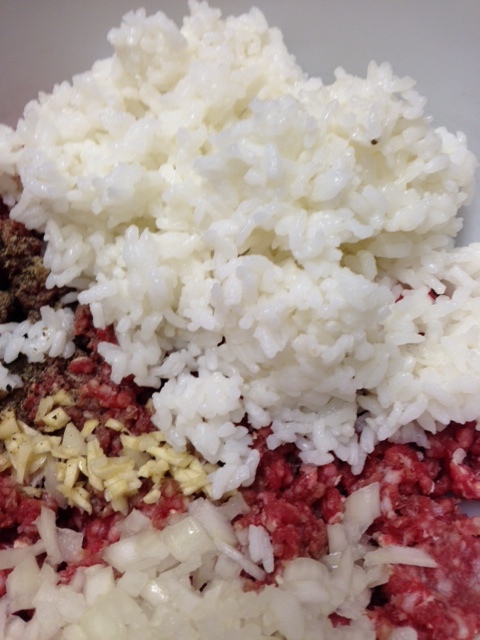 Mix the ground beef or turkey, the onion, the 2 tblsp of tomato sauce and the rice together. Form into 4 good sized balls. Place in a baking dish. Mix together the 2 cans of tomato sauce, salt and pepper. Pour it over the balls and bake at 350 for about 45 minutes-1 hour. 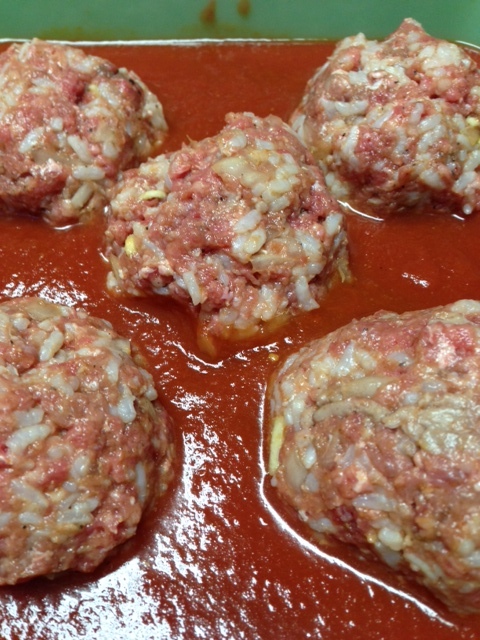 Serve with a scoop of the sauce over the meatballs. Great with corn, green beans, a salad…whatever you want! Is that easy or what!! Yum! At my house this is known as, Albondigas! Favorite at my house too! However, I have never but used El Pato sauce, I’ll have to give that a try! yes!! 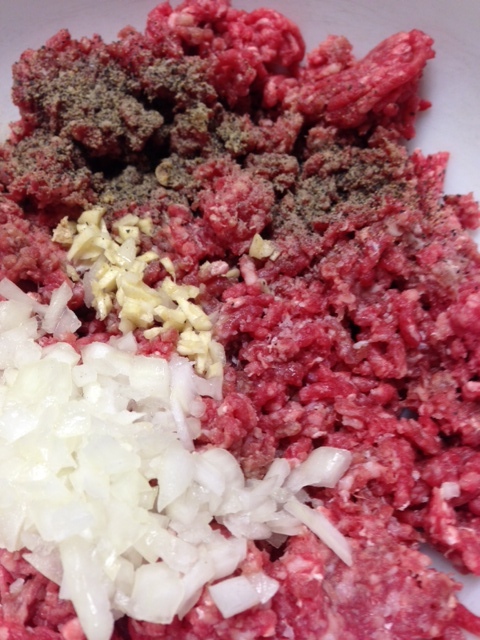 albondigas….I love albondigas soup! Jen, you must try it with the El Pato. yummy!